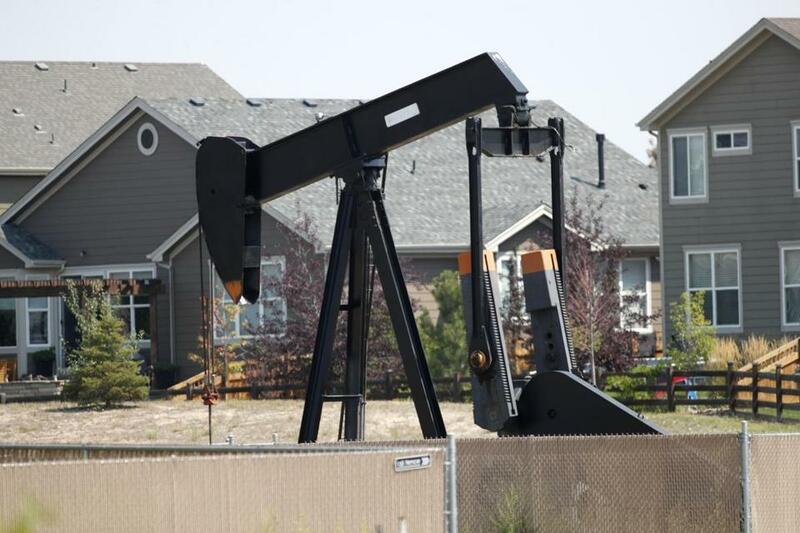 A pump jack in a recently constructed residential development in Frederick, Colo.
Efforts to nudge the nation away from burning fossil fuels and toward harnessing renewable source of energy were rejected by voters Tuesday across a swath of resource-rich states in western states. The failure of environmental ballot measures in Arizona, Colorado — and the likely defeat of a proposal to impose fees on carbon emissions in Washington state — underscore the difficulty of tackling a global problem like climate change at the state and local level, where huge sums of money poured in on both sides. Even as a United Nations-backed panel of scientists recently warned that the world has barely a decade to radically cut its emissions of greenhouse gases that fuel global warming, the Trump administration has been busy expanding oil and gas drilling and rolling back Obama-era efforts to mitigate climate change. Environmental advocates and Democratic lawmakers have placed much hope in state and local governments to counter those policies. But while Tuesday saw the election of numerous candidates dedicated to climate action, individual ballot measures aimed at the same goal largely floundered. Even in the solidly blue state of Washington, initial results looked grim for perhaps the most consequential climate-related ballot measure in the country this fall: A statewide initiative that would have imposed a first-in-the-nation fee on emissions of carbon dioxide, the most prevalent of the greenhouse gases that drive global warming. While voters in King County, home to Seattle, turned out heavily in favor of the measure, residents across the rest of the state largely opposed it. One bright spot for environmental advocates came in Nevada, where voters appeared poised to pass a measure similar to the one Arizonans rejected. It would require utilities to generate 50 percent of their electricity from renewables by 2030. The proposal was leading handily with most votes tallied Wednesday. But before the measure could become law, it has to survive a second vote in 2020. Since President Trump took office, a handful of states — notably California — have vowed to serve as a counterweight on energy and environmental policy to the president, who frequently dismisses the government’s own findings that human activity is warming the globe. In September, California codified into law a commitment to produce 100 percent of its electricity from carbon-free courses by 2045. But Tuesday’s ballot-question results demonstrate the limits to which other states are willing to follow California’s lead — particularly when campaigners against the proposals emphasize the potential impact on pocketbooks. ‘‘What we learned from this election, in states like Colorado, Arizona, and Washington, is that voters reject policies that would make energy more expensive and less reliable,’’ Thomas Pyle, president of the American Energy Alliance, an industry-backed free-market advocacy group, said in a statement.